Aww, Glenn Rolfe has done it again! 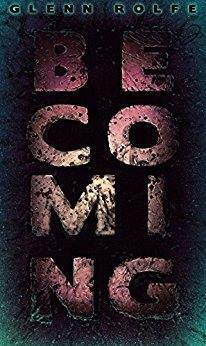 Another fast-paced read from beginning to end, Becoming, shows that Rolfe is indeed, becoming a force to be reckoned with. I don’t know about you guys, but back in the day (early 70’s) when John Saul, Dean Koontz, and that other guy, Stephen King, were getting started in their horror writing careers, this was the type of story they would write and I would want to read. Always creepy enough to keep your interest and always leaving you anxiously awaiting to see what the next book would be about. I like that about Glenn’s books, the themes are varied and with each new offering, we find a stronger than the last time story. Avalon is a small, quiet, lakeside town in Maine. It’s been there forever, but most folks don’t know much about the town’s history. Soon, all that will change! While Michele and her best friend, Greg are hanging around the lake one day, Greg notices something in the water, his mistake… was picking it up. Before Michele can even react, something reaches out of the lake and snatches Greg. Michele has a hard time getting anyone to believe her story, soon more people begin to disappear. Only one person knows the lake’s terrible secrets, but he has problems of his own and just wants to get out of Dodge before it’s too late. Meanwhile, Sheriff Davis has been going crazy trying to figure out what the hell is going on and begins to believe perhaps Michele did witness something supernatural, but will that knowledge be enough to save the folks of Avalon? Hmm, I think you should pick up the book and find out for yourself, you won’t be disappointed. And, if the answer to the above question isn’t enough to entice you into buying the book, Glenn has also included a bonus novella, Boom Town. So, there you have it, two great reads for the price of one! You can get your copy HERE! !